Nicola Mining Inc. Provides Exploration Update on its New Craigmont Copper Project | Nicola Mining Inc.
VANCOUVER, B.C., July 19, 2018 – Nicola Mining Inc. (TSX.V: NIM), (the “Company” or “Nicola”) is pleased to announce that it has received all required permits and has commenced the 2018 diamond drilling program (the “2018 DD Program”) at its wholly-owned New Craigmont Project, located approximately 10 kilometers west of Merritt and 20 km south of the Highland Valley Operation. Following analysis of two induced polarization geophysical surveys (the “2017 IP Survey”), which were announced in November 10, 2017 and July 24, 2017 news releases, the Company has finalized initial drill hole locations (Figure 1). Finalization of initial drill hole targets was based on a comprehensive analysis of induced polarization (“IP”), mapping, historical sampling, and digitalization of historical diamond drilling results. 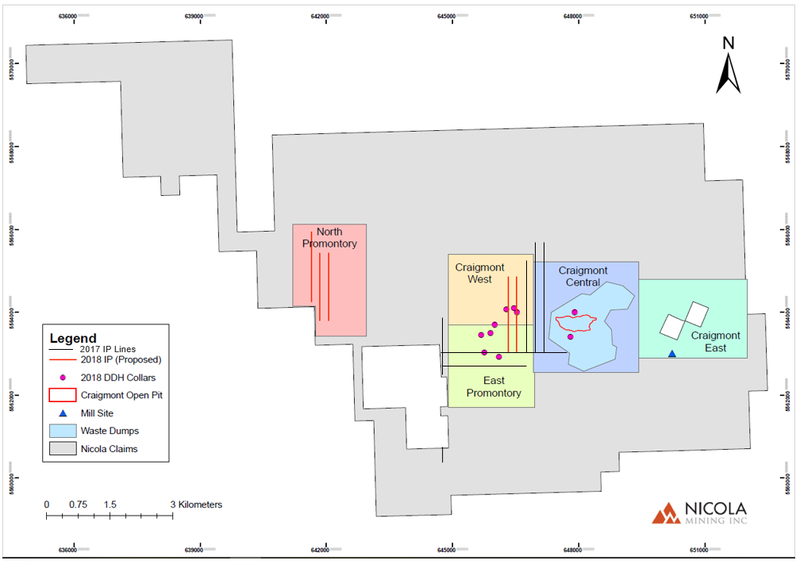 The review also highlighted the significant scale and potential of the New Craigmont Project and the importance of developing a multi-year disciplined approach that incorporates several exploration techniques. Concurrently with the 2018 DD Program, the Company will conduct additional IP, geological mapping of key target zones, and geochemical sampling of previous and new targets. The 2018 DD Program will consist of approximately 5,500 metres, encompassing 10 initial holes in three sections: Craigmont Central, Craigmont West and East Promontory. In addition, the Company will conduct geochemical sampling and IP ground geophysics over the North Promontory zone. The areas and the exploration strategies for each are explained below. Nicola has awarded Atlas Drilling Ltd., located in Kamloops, BC, the contract for the 2018 DD Program. The two-drill program is expected to be completed in early September. Phase 1 of the reverse circular (“RC”) drill program on the historic wastepiles is now complete with assays pending. Next steps, which may include Phase 2 RC exploration, will be determined upon review of assay results. Craigmont West is an area to the west of the Craigmont open pit and includes the Embayment, Marb and Titan Queen showings. It is bound to the east by Craigmont Central and to the south by East Promontory (Figure 2). This area has been, and continues to be, a significant area of focus for Nicola. Preliminary 3D modelling of the skarn suggests the zone strikes roughly east-west and dips to the south. High grade lenses of skarn are found intercalated with sedimentary and volcanic units encompassing a 200-metre-wide corridor with variable grades and continue to remain open westward. 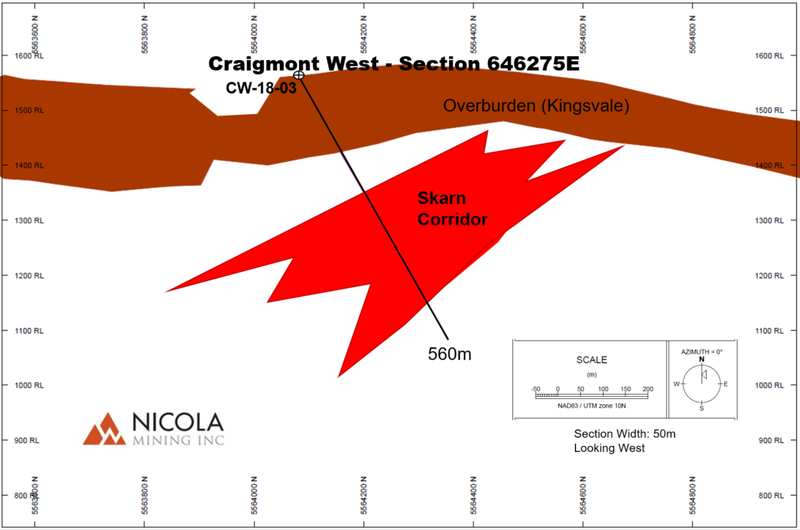 Drill hole NC-2018-03 intersected 100.6 metres grading 1.33% Cu as announced in the Company’s April 2, 2018 news release is located within the Craigmont West zone. The 2018 DD Program includes three proposed diamond drill holes targeting the westward and down-plunge extension of the skarn, based on the geological model. Cross-sections showing the planned drill hole trace along with the modelled overburden and skarn have been produced (see Figures 3,4, and 5). Two lines located to the west of lines surveyed last year will be surveyed using ground IP and magnetics. These lines will help provide additional information about the geometry and extent of the known zone and augment future drill hole targeting. In addition, the information will help Nicola to better understand the relationship between the southern contact of the Guichon batholith and its influence on mineralization. East Promontory includes the historic Promontory Hill showing but has been expanded to include porphyry targets identified in the 2017 IP Survey. The 2018 DD Program includes five diamond drill holes (Figure 2) that are targeted to examine the geophysical anomalies identified in the 2017 IP survey. 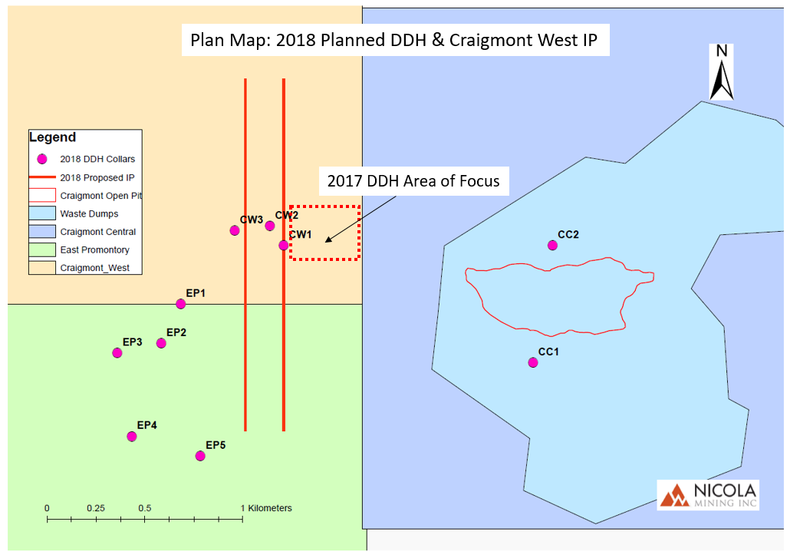 The additional two IP lines described above in Craigmont West will extend south into the East Promontory block as a follow up to the 2017 IP Survey and also help verify a chargeability inversion model identified in the 2005 IP survey completed by Frontier Geosciences Inc. that is described in the Company’s July 25, 2017 news release. Both surveys identified an unexplained chargeability anomaly in the area. Craigmont Central encompasses the Craigmont open pit, underground mine and wastepiles. As previously mentioned, a follow-up RC drilling program on the waste stockpiles will be executed this year, if warranted. 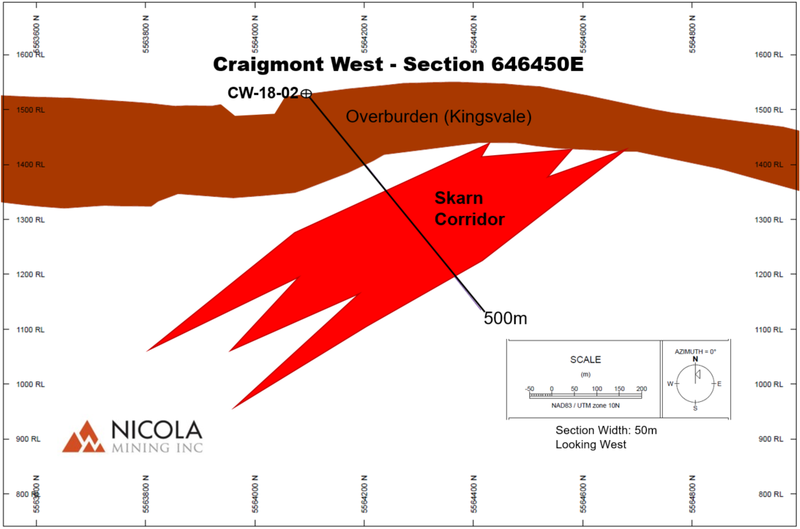 Two diamond drill holes have been planned to test the mineralized corridor, or halo, that encompasses the skarn deposit and associated alteration around the pit. Drilling will target shallow mineralization within the pit walls by stepping back and drilling the in-situ rock. The North Promontory area includes the Marb72/Gus and WP historic showings. Nicola plans to complete three north-south IP lines that will aim to correlate existing magnetic and sampling data collected in the area. The Company would also like to provide clarity on its April 5, 2013 news release in which the previous President and CEO incorrectly issued a statement that the Company had achieved commercial production. Based on the tonnage of concentrate produced and mill’s throughput, the Company had not reached commercial production. All information of a scientific or technical nature contained in this document has been reviewed and approved by Kevin Wells, P. Geo., a consulting Geologist to the Company. Mr. Wells is a Qualified Person as defined by National Instrument 43-101 – Standards of Disclosure for Mineral Projects (“NI 43-101”). 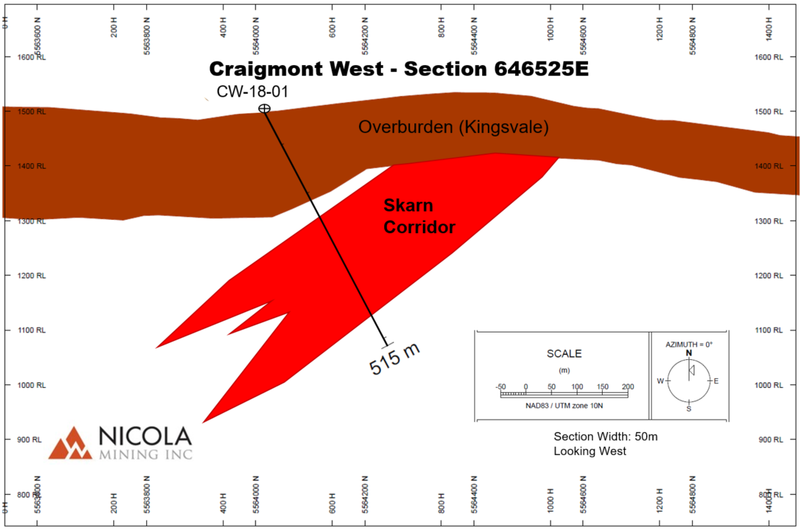 The New Craigmont Project (the “Property”) is a wholly-owned copper property with an active mine permit (M-68), located within the world-class Highland Valley porphyry district. It benefits from excellent infrastructure. The Property is at the corner intersection of the Nicola and Guichon batholiths, of which the latter is the precursor to mineralization at Highland Valley. In November of 2015, Nicola became the first group in decades to consolidate ownership of the Property, and has been actively conducting mineral exploration since. There are currently no mineral resource estimates on the Property. Historical “non-NI 43-101” resource calculations are recorded in internal memos and geological reports for Placer Development. An internal memo written by J.F. Bristow on October 30, 1985 to Craigmont Mines Ltd. reported a zone known as Body No. 3 containing a historic estimate of 1,290,000 tons (1,170,268 metric tonnes) of copper grading 1.53% copper. * This estimate assumes a 0.7% copper cut-off and a 20-foot mining width between drill sections 6565E and 8015E. The material in Body No. 3 contains mineralization primarily in silicate-rich rocks. It should be noted that these historical estimates do not meet the requirements needed to conform to National Instrument 43-101 standards. The Company notes that an independent Qualified Person has not done sufficient work to verify and classify the historical estimates as current mineral resources and is therefore not treating the historical estimates as current mineral resources or mineral reserves. For further details on the Property, see the technical report entitled “TECHNICAL REPORT on the THULE COPPER – IRON PROPERTY, Southern British Columbia, Canada”, filed on May 8, 2013 on Sedar at www.sedar.com. information provided by third parties, including access to historical information on the Property; current exploration and development activities; current economic conditions; future prices of commodities; possible variations in grade or recovery rates; failure of equipment or processes to operate as anticipated; the failure of contracted parties to perform; labor disputes and other risks of the mining industry; and delays in obtaining governmental approvals, financing or in the completion of exploration. Although the Company has attempted to identify important factors that could cause actual actions, events or results to differ materially from those described in forward-looking information, there may be other factors that cause actions, events or results not to be as anticipated, estimated or intended. There can be no assurance that such information will prove to be accurate as actual results and future events could differ materially from those anticipated in such statements. Forward-looking information is provided as of the date hereof and accordingly is subject to change after such date. The Company does not undertake to update any forward-looking information included in this news release, except as required by applicable securities laws.